This is a wrap-up to our series on finding and assessing used harps for sale. In a nutshell, I recommend educating yourself as much as you can about the harps that are available in your area, as well as around your country. Find out the asking prices for similar models in different areas, so that you have an idea of the going rate for a given model. Get to know harps and their sellers in advance by contacting and talking to them, and ask for close-up photos to help you assess the harp’s condition. Go in person to inspect the harp if at all possible, and send a qualified surrogate, such as a harp technician or experienced harpist if you absolutely can’t look at the harp yourself. 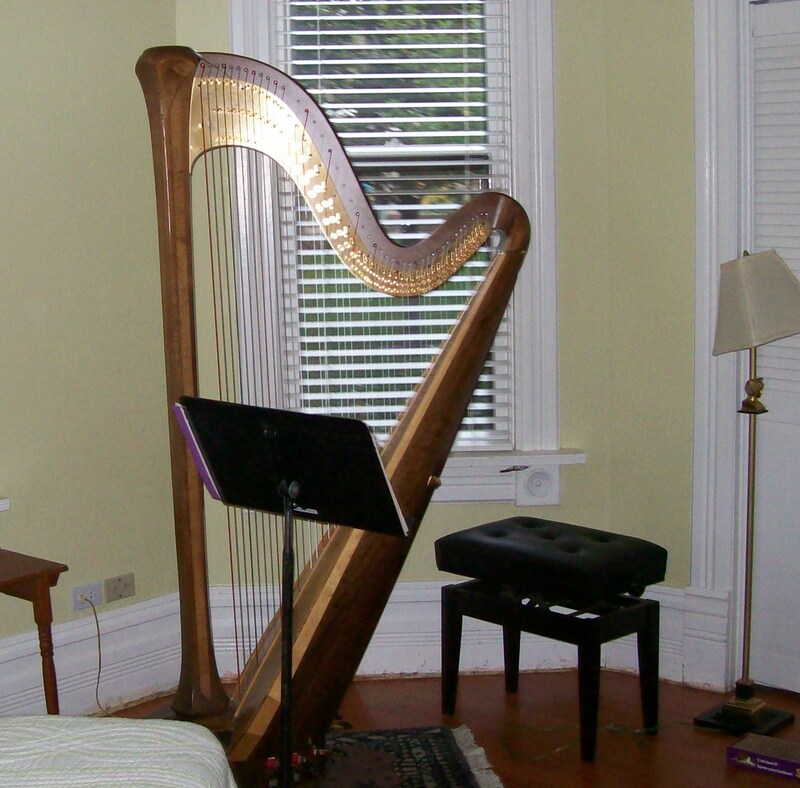 Once you’ve determined the harp you want to buy, discuss acceptable terms with the seller. Because thousands of dollars are often involved, the seller may prefer a cashier’s check or cash to a personal check. Finally, make an offer. Don’t be afraid to negotiate. 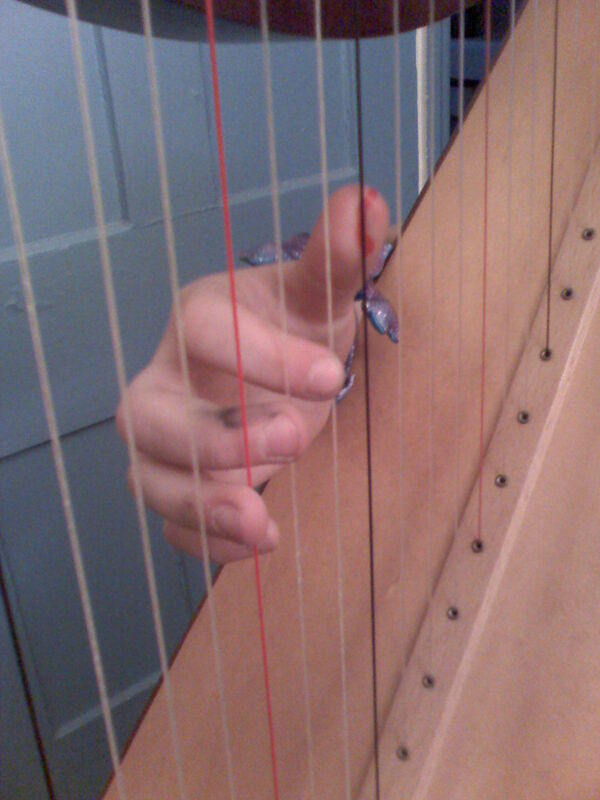 While no data is available, I believe that most harps sell for less than the original asking price, just like homes do. This may not be the case from dealers and manufacturers, but I believe it is in private sales. How much less? I wish I knew. I’m sure it varies quite a lot. Just remember that if you are asking a seller to accept a lower price, it is expected that you will back up the offer you made and close the deal. Here is where doing your price shopping homework may save you money. Can you find a good buy on a used harp? Yes. It happens all the time. But getting good value depends on knowledge of the product and the market. Assuming you are not already an experienced harp buyer, you will need to do your homework, and between screening sellers and traveling to look at instruments, you may have to invest quite a bit of time. While that shiny new harp with its three-to-five year warranty may seem awfully expensive, if you are new to the harp, don’t underestimate the amount of time and work it will take to find a really good value on the used harp market. In part 4 of this series, we talked about having an expert, such as a harp technician or an experienced harpist look at an instrument you’re interested in. This is generally the most foolproof way of making sure the harp that looks and sounds good to you isn’t sporting any expensive issues that you may have missed. But what if this isn’t an option? You don’t know very many harpists and the ones you do know don’t feel they know much about harps beyond how to play them. What do you do then? Well, that depends on you. You may wish to wait on this purchase until you’ve been around the harp world a little longer and had a chance to meet more harpists who may be more experienced and willing to help. You may find that a technician is scheduled to be in your area and plan to line up a harp or two that are for sale and have the technician look at them for you when he or she comes to town. You may decide you’re safer just buying new – maybe a smaller or plainer harp than you may have wanted, but one that the company guarantees is in good condition. You may decide to stick with playing the violin or french horn, but I hope you won’t. Or, you may want to try and do a detailed inspection of the harp yourself. Are you crazy, you may ask? No, you’re not crazy, its something that harpists have to do all the time. We’re a small and spread out community, and sometimes there’s no one around to tell us what to do. Be advised, however, that there are a large number of things that can be wrong with used harps, and they are not always obvious. In order to do a thorough inspection yourself, you’ll need a lot more information than I can provide in a series of blog posts. You’ll need to educate yourself about the structural issues a harp can face in its life, how to tell if an aging harp is hanging in there just fine or is about to need a new soundboard or re-riveted action. It’s a tall order, and it took me years to learn what I know now, but you can educate yourself about the basics. There’s not a lot of really technical information about harps on the Internet. I have a few blog posts and newsletter articles on advanced subjects such as assessing the condition of the base frame, but for the most part people leave these matters to the professionals. If you need to get some pointers on inspecting a harp for yourself, contact the technician you see yourself working with as the new owner of this harp, i.e. one who comes to your area once a year, or who lives nearby. Ask him or her for the cliff notes on a harp’s structural issues. I can’t promise you’ll get an answer. Most people ask us technicians technical questions, and then we watch their eyes glaze over as we start to answer them. But, it’s worth a try. 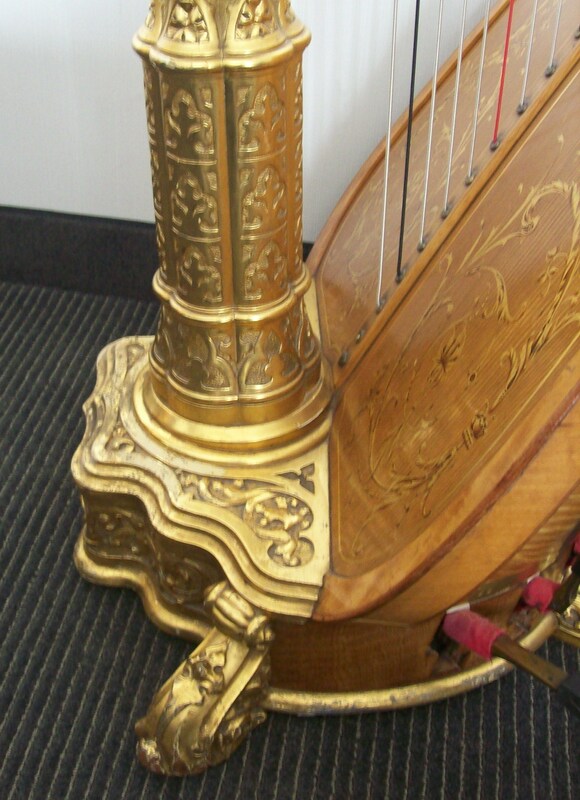 Also, we talked about asking the seller for detailed photographs of the harp. If you have some of these you can ask a technician to look at them and give you an opinion. There may be a fee for help like this. It depends on the technician. If there is a fee, it may be well worth it if it helps you arrive at a more informed opinion of a harp you want to buy. When all else fails, at least bring someone with you when you go to look at the harp, even a parent or a good non-harpist friend. Ask this person to observe the scene as you look at the harp. How does it look to his or her (non-harpist) eyes? How does the house look? Is it messy or clean, organized or post-hurricaine? Does the seller seem friendly, trustworthy, or perhaps less so? Even if this friend doesn’t know the first thing about harps, he or she may be able to help you read the situation, and you’ll have someone to exchange ideas and thoughts with as you go about the process of trying to make a buying decision. Talk to her out of the seller’s earshot for a while. Get her take on the situation. Ask whether she leans toward or against buying the harp. Hearing her reaction may help you get in touch with your own gut reaction to this instrument and this seller. You may find your friend confirming a feeling you had but may not have even been aware of. Someone to help you keep things in perspective may help you avoid making a bad decision when you’re tired of looking for a harp and just want to buy the next one that comes along. In our last post, we talked about pre-screening harps and sellers by having a phone conversation and asking for additional photos of a harp you may be interested in buying. Sometimes, however, you might hear about a really good deal on a harp out in California but you live in South Carolina. What should you do? In my opinion, you should have a knowledgeable person inspect it, or you should decide not to buy it. If you buy a harp that must be shipped to you, this will add to the cost of your purchase. If you receive it and find there’s something wrong with it, even if the seller agrees to take it back, there’s the cost of return shipping. The stakes are higher if you do business this way, and it is easier to end up with a harp you aren’t happy with. So, who do I mean by a “knowledgeable person?” In most cases, this ideally means a technician like me, who is used to inspecting harps, knows what to look for, and knows how to spot repair issues that the seller might not even be aware of. If there is a technician in or near the area where the harp you’re interested in is located, or a technician is scheduled to visit, then you’re in luck. You can contact the technician and see if he or she is available to take a look at the instrument for you. There will certainly be a fee, but it could save you a lot of money if the technician is able to see something wrong with the harp. You can find certified technicians through the manufacturer of the harp you’re interested in. Some harpists are also quite knowledgeable about structural and repair issues on harps, but some are not. If you know a harpist who happens to live near the harp in question, ask her if she feels comfortable having a look at the instrument. Even if she may not have the technical knowledge a technician has, she may be able to further assess the care the harp has received by looking first-hand at the harp and talking in person with the seller. She will be able to tell whether the harp is reasonably in tune, indicating that it has been cared for by a knowledgeable owner, or if it is way out of tune, which probably means it has been sitting neglected for a long time, and its strings will need to be replaced. A harpist will also be able to give you some good feedback on the harp’s sound, which is also a very important factor in determining what to buy. Unfortunately, technicians don’t live or go everywhere, and one might not be around when you need one. If you don’t know a harpist who can look at and play the harp, and can’t get a technician, I would advise you to think about looking for a different harp. It may not be the advice you want to hear, but it could save you a lot of grief in the long run. However, if you’re willing to do more research and spend more time, and you really, really want to buy this harp and not some other one, check out the next post. In the previous post in this series, we discussed ways of finding used harps for sale, both by consulting local harpists and teachers, and by searching Internet resources including ebay and harp dealers across the country who advertise used harps for sale. We also talked about educating yourself about the prices sellers are asking for harps like the one you’re interested in, so that you can tell whether one that may be available near you is competitively priced, a steal, or an absolute rip-off. If you find a harp right near you, by all means schedule a time to go and look at it. More often than not, however, you may find yourself needing to drive a few hours, or maybe even out of state in order to look at a used harp. In this case, contact the buyer, and see what you can learn. By asking the right questions, you’ll be able to get a better sense of the harp’s history, and whether the seller is someone you feel comfortable talking with. Get the seller talking with questions like “how long have you had the harp?” “Do you play, or is it someone else in your family?” How old is the harp?” By asking open-ended questions like these, you can hopefully pick up clues about where this harp has been and how it has been cared for. In many cases, the harp has been owned and played by someone who wants to upgrade to a fancier model, or by a student who subsequently stopped studying. Other times, though, you might determine that the harp was bought in an estate sale, and the owner may not know a thing about harps. It is not necessarily bad to do business with this type of seller, but it is important to realize that he or she may not be able tell you anything reliable about the harp’s condition. You may also request that the seller email some photos. While they may have one or two shots of the entire harp, and perhaps one of the maker’s name or serial number, see if they are willing to snap some close-ups of the strings, the soundboard, the base, the pedals and the neck. 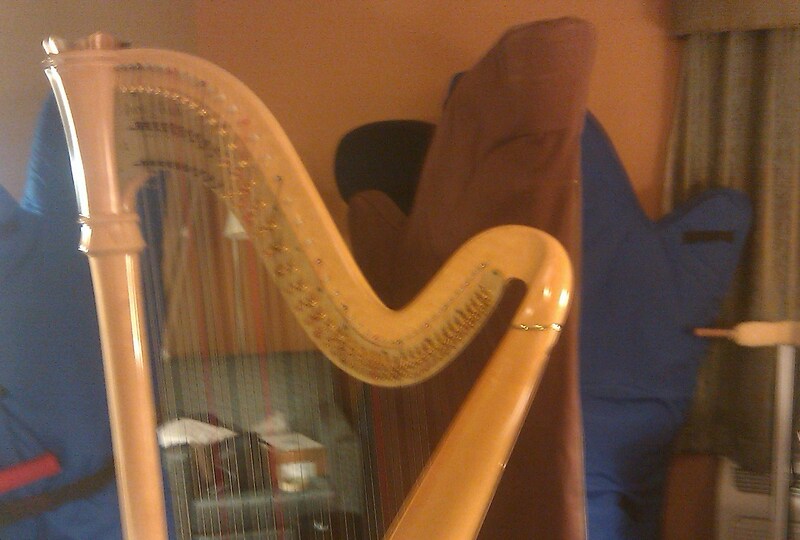 With photos like these, you can continue to get a better sense of how a harp has been treated. If it’s missing a large number of strings, for instance, it probably has not been played in a long time. If the pedal slots in the base have veneer missing or separating, the harp may have moisture damage, or it may simply be quite old. Assuming it is going to take hours of driving time just to look at a harp you’re interested in, you may be able to screen out some by a brief conversation and some photographs, and save your driving for the prospects you feel most comfortable with and excited about. But what if the harp is a thousand miles away and it’s just not feasible for you to go and look in person? We’ll talk about that next time. It can be tough to find very many harps on the market at a given time in a given area, and there’s no guarantee that the size, style, and brand you’re looking for will be for sale when you need it. If you’re willing to drive some distance, your chances of having a choice will increase. It is even possible to arrange to buy a harp somewhere far away and have it shipped to you, but you have to decide whether you want to buy the harp without ever getting a chance to see or hear it in person. 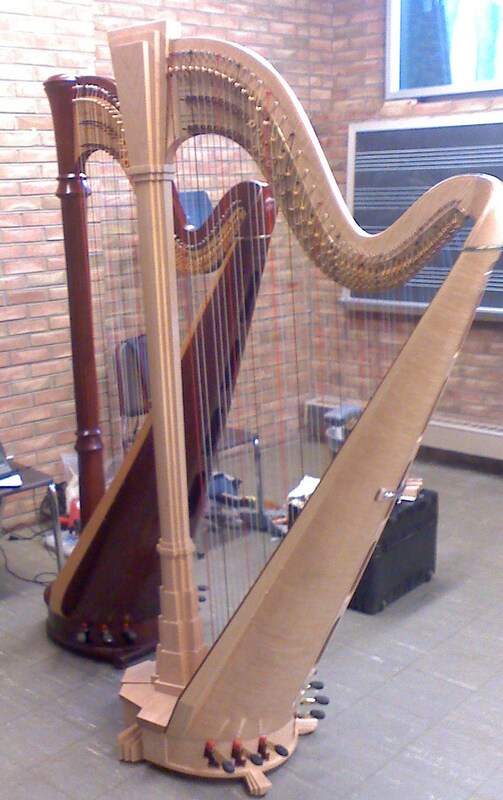 To find harps for sale, contact teachers, professional harpists, and fellow students in your area. The more people you ask, the more likely you are to pick up a lead. You can do the same thing with harpists in other cities that you’re willing to drive to. If you happen to live near one of the handful of retail outlets for harps such as Lyon & Healy West, Vanderbilt Music, or the Harp Connection, give them a call to see if they currently have anything used for sale. To search nationally, you can check the classified ads in Harp Column Magazine, browse the selection of Certified Pre-Owned Harps available through Lyon & Healy, or contact all of the stores named above, as well as others such as Salvi Harps Incorporated, or the Virginia or Atlanta Harp Center. Yes, you can also find harps for sale on ebay, and a lot of them. While I wouldn’t recommend that you buy one sight-unseen, you may find listings for harps in your area, and the seller may be willing to let you have a look at it in person. Even if you find a harp or two for sale close by, it’s worth consulting all of these resources to see what’s out there. You can always use ebay and some of the stores who sell used harps for comparison shopping even if you don’t buy from them. There’s no Kelley Blue Book for harps, and no final authority on what they should be worth. It would be good to have as much information as possible about asking prices for harps across the country. By pulling both local and Internet resources together, hopefully you will find at least one harp, maybe more, that matches your interests and price range. In our next post, we’ll discuss what happens next, and how to pre-screen a harp AND its seller before making a trip to visit it.